Kuwait Authority for Partnership Projects (KAPP) is developing a municipal solid waste project that involves the construction of a waste-to-energy facility, located in the Kabd area. Earlier in August it was announced that KAPP has selected the consortium consortium of Constructions Industrielles de la Mediterranee (CNIM), Gulf Investment Corporation and Al Mulla Group to design, build and operate the project. For the full details of this project, click here. The City of Bucaramanga is developing a waste management project involving the construction of a waste-to-energy facility and the installation of new technology. It was decided that Vitalogic RSU would be awarded the contract, but the deadline for this process was extended to allow the Attorney General’s Office to resolve its doubts regarding the project. To catch up on the latest with this project, click here. Construction work has started on an MBT facility in Epirus, where sorting, anaerobic digestion (AD) and composting units will be installed. Hitachi Zosen Inova has been selected to build the dry AD plant, which will handle the organic fraction supplied from the MBT’s sorting line. Once complete, the facility will be able to treat around 72,000 tonnes of residual mixed municipal waste and 8,000 tonnes of source-separated biowaste each year. Operations are expected to begin within 18 months. For the full information associated with this project, including access to key decision-maker contact details, click here. KPA Unicon has signed a contract to supply a biomass power plant that will generate 5 MWe for the local power grid and 7.2MWth for a nearby wood processing plant. The plant’s design is based on KPA Unicon’s Biograte combustion technology and will use wood as feedstock, of which 46,000 tonnes per year will be supplied by Hrvatske Šume. Work on site commenced last December and are expected to continue until the handover date in the autumn of 2018. If you’d like to find out more details from this project, it will be available to access in full for the next 7 days. Make sure you don’t miss out by clicking here. Next up in our series of Global Waste Investment Fact Files is the Turkey edition. As of August 2017, AcuComm was listing 11 projects in the country, with a total value of US$681 million, or US$62 million each. Incineration (with energy recovery) is the leading project type, accounting for US$367 million or 54% of the total. This is followed by recycling, accounting for US$133 million or 20%. The total estimated capacity of these projects is 3.5 million tonnes. This is equal to 316,338 tonnes per project on average. This capacity is equal to 12% of Turkey’s estimated annual waste generation, at 28 million tonnes. Waste investments totalling US$532 million are expected to become operational over the next few years. This is currently expected to peak in 2019 at US$260 million. Click here to download this Fact File. Alternatively, you can take a look at all of AcuComm’s projects in Turkey by clicking here. Catherine Coble, NWMDA’s Director of Finance and Administration, has confirmed to AcuComm that a project to build high diversion material recycling facilities in Baltimore County, Maryland has been cancelled. If the project had proceeded, the facilities were to incorporate state-of-the-art technology to sort municipal solid waste and sort them into recoverable re-salable materials. In the week ended 25th August 2017, AcuComm added 42 new or updated projects to our Business db, worth an estimated US$4,900 million and feedstock capacity of just under 10.6 million tonnes. 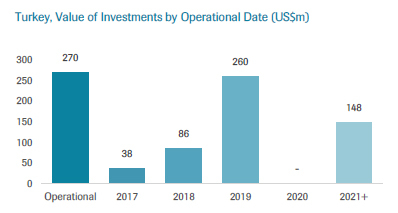 This takes the total estimated investment value of projects to US$386.2 billion. The leading country in the past week was the USA, with ten projects reported on. This was followed by the UK and China with four each. The average waste project is worth US$75 million. Looking for practical project information to help increase your sales and win new business? Full access to AcuComm’s Business db will not only provide you with this but will also keep you up-to-date with any projects you’re targeting. A new recycling facility for construction and demolition (C&D) waste is now operational in Rohini, processing up to 150 tonnes each day. The facility, which was commissioned by the Delhi Metro Rail Corporation, will accept waste like concrete blocks, broken bricks, cement plaster, rubble, soil and more. If you’d like to take a look at the full details of this project, you can do so by clicking here. Next up in our series of Company Briefings is the Saxlund International edition. Based at its HQ in Southampton, United Kingdom, the company’s principal roles within the industry are as equipment supplier and contractor/engineer. Currently, AcuComm holds 25 projects for the company in our database. These have a total estimated value of US$2,878 million, or US$115 million on average. 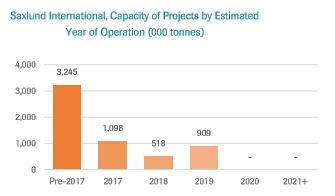 The overall annual capacity of the Saxlund International projects in our database is just under 5.8 million tonnes. This is equal to an average of 230,767 tonnes per project. AcuComm estimates that all 25 projects involve power generation in some form, amounting to a total of 789 MW. The company’s principal area of activity is incineration with energy recovery. This accounts for 79% of announced projects. The majority of projects for Saxlund are either operational or under construction. 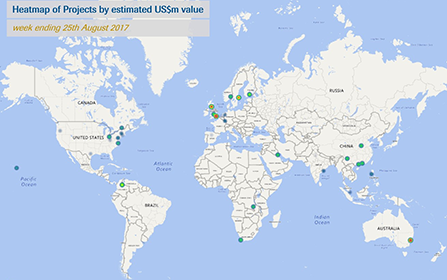 As of July 2017, ten projects were operational. A further 12 are under construction. Click here to download the full Company Briefing. Alternatively, you can take a look at all of Saxlund International’s projects in the AcuComm database by clicking here. Earlier this month, FS Bioenergia officially inaugurated the first modern corn ethanol plant in the country. Located near Lucas do Rio Verde in Mato Grosso, the plant was built at a cost of US$115 million and will produce around 240 million litres of ethanol, 6,200 tonnes of corn oil and 60,000 MW of power each year. Elektroprivreda Srbije (EPS) has issued a tender for a feasibility study and preliminary design of a combined heat and power (CHP) biomass plant in Zrenjanin. The proposal suggests that the plant should have storage capacity that would be enough to supply the plant 24/7 and a maximum heat output of 10.5 MWth. To keep up-to-date on this project, click here. Martin GmbH has announced that its licensee, Chongqing Sanfeng Covanta Environmental Industry, is to supply two grate systems for a waste-to-energy (WtE) facility in Guangdong Province. Once complete, the facility will process over 430,000 tonnes of municipal solid waste per year. Full access to this project is only available for a limited time, so don’t miss it! Click here to find out more.